In the 17th century, the area of the Yıldız palace between Beşiktaş and Ortaköy was called “Kazancıoğlu Gardens (Bahçeleri)” and was originally natural woodlands. It became an imperial estate as one of the court gardens (Hasbahçe) during the reign of Sultan Ahmed I (1603-1617). A small pavilion, which was built on the top of the Beşiktaş hill by Sultan Ahmed I, was presented by Sultan Murad IV (1623-1640) to his own daughter, Kaya Sultan. Under the reign of Sultan Selim III (1789-1807), the summer palace named “Yıldız” was built for his mother Mihrişah Valide Sultan. Later, the area became to be called as “Yıldız”. In the reign of Sultan Mahmud II (1808-1839), he ordered a small pavilion to be built in order to watch the exercises of the newly established “Asakir-i Mansure-i Muhammediye” army. Sultan Abdülmecid (1839-1861) ordered the buildings to be taken down and a new pavilion “Kasr-ı Dilküşa” built for his mother, Bezm-i Alem Sultan. During the reign of Sultan Abdülaziz (1861-1876), the pavilions were renovated and new pavilions and summer palaces were built in the area. In those years, the pavilions and summer palaces including Şale Pavilion, Malta Pavilion, Çadır Pavilion, Büyük Mabeyn (State Apartments), which were built by Sarkis and Agop Bey Balyan by the order of Sultan Abdülaziz in 1866, were gathered together, and became the single complex now known as the “Yıldız Palace”. Not only Balyans, but also other architects of different origin and engineers including Alexandre Vallaury, Raimond d’Aronco, Jachmund, Aznavuryan Ohannes, Bethier, François, Yanko, Nikoli, Dikra and Vasilaki, created buildings palace buildings, and established the special fashion in Ottoman court architecture in the 19th century. After the deposition of Sultan Murad V, Sultan Abdülhamid II decided to move to the Yıldız Palace, which was more secure than the Dolmabahçe Palace. The Ottoman Administration moved to the Yıldız Palace in 1877 and resided there until 1909. The palace complex housed more than 12,000 people, including workers in the imperial porcelain factory, barracks, the Yıldız Theater and opera house, library, museum, carpenter’s workshop, and repair shop. As the result of default in the public funds and an empty treasury, the 1875 insurrection in Bosnia and Herzegovina, the war with Serbia and Montenegro and the feeling aroused throughout Europe by the cruelty used in stamping out the Bulgarian rebellion, Sultan Abdülhamid II was dethroned by the government. After the deposition, the Yıldız palace except the library was plundered, and most of the furniture and precious objects were ravaged. Today, the photograph and manuscripts collections, which were kept in the Yıldız palace library, are preserved in the library of Istanbul University. After the declaration of the Republic, the palace was used as a luxury casino before being turned into a guest house for visiting heads of state and royalty. Today, it serves as a museum, and its gardens can be used for private receptions. 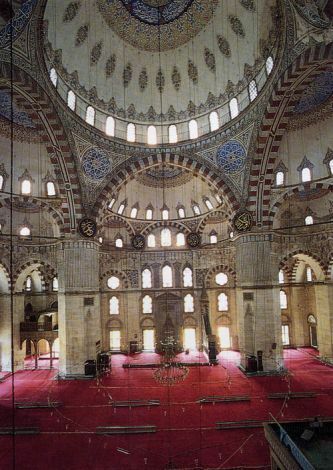 Reference: Yıldız Sarayı Şale Kasr-ı Hümayunu (Istanbul: Milli Saraylar Daire Başkanlığı Yayını, 1993).